Laser Components also has multi-mode fibers and special fibers, such as, for example, sapphire fibers and hollow-core fibers available. In addition to these fibers, POFs and cables for applications with special requirements are also available. Indoor and outdoor fiber optic cables are available in different designs. The SI200/230 optical fiber with a numerical aperture of 0.37 is the standard used in fiber optic cables. Depending on the customer’s requirements, other combinations are also available. Outdoor cables are suited for applications under harsh environmental conditions. They are equipped with 2, 4, or even 6 optical fibers. All standard connector systems can be assembled. Outdoor fiber optic cables are normally delivered with the SI200/230 step-index fiber, the numerical aperture (NA) of which is 0.37. The cables can, of course, also be delivered with other fibers. Ask our product specialists directly about the possible combinations! Multiplex or breakout cables can be used both indoors and outdoors. Multiplex cables are used for point-to-point connections in which several fibers are required for data transmission. 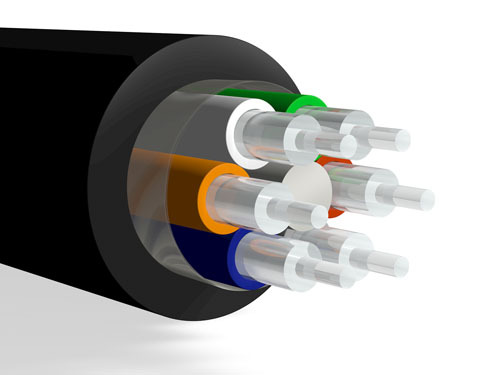 Typically, 2, 4, or 6 optical fibers are used in these cables; versions with 12 and 24 integrated fibers are also available. The standard diameters are between 5 mm and 10 mm – depending on the number of fibers and the properties of the cable.